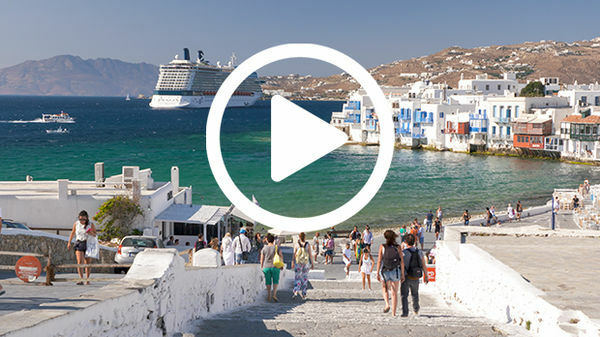 The thriving capital of Greece sprawls out from the foot of its magnificent Acropolis. We'll tour the must-sees of ancient Athens: the Parthenon, Agora, and amazing National Archaeological Museum. We'll take the fast-paced pulse of the modern city, but waste no time getting to Rick's favorite side-trip destinations: the ruins of the mystical oracle at Delphi and a fast boat to the romantic, traffic-free isle of Hydra. The four major monuments — the Parthenon, Erechtheion, Propylaea, and Temple of Athena Nike — were built as a coherent ensemble (c. 450–400 BC). Unlike most ancient sites, which have layer upon layer of ruins from different periods, the Acropolis we see today was started and finished within two generations — a snapshot of the Golden Age set in stone. There's no way to reach the Acropolis without a lot of climbing (though people with disabilities can use an elevator). Arrive early or late to avoid the crowds and midday heat. The worst lines are caused by the bottleneck of people trying to squeeze into the site through the Propylaea gate. Late in the day, as the sun goes down, the white Parthenon stone gleams a creamy golden brown, and what had been a tourist war zone is suddenly peaceful. While the Acropolis was the ceremonial showpiece, the Agora was the real heart of ancient Athens. For some 800 years, until its destruction by barbarians in AD 267, it was the hub of all commercial, political, and social life in Athens, as well as home to much of its religious life. Agora means "gathering place," but you could call this space by any of the names we typically give to the busiest part of a city — downtown, main square, forum, piazza, marketplace, commons, and so on. Little survives from the classical agora. Other than one very well-preserved temple and a rebuilt stoa, it's a field of humble ruins. But that makes it a quiet, uncrowded spot — nestled in the shadow of the Acropolis — to wander and get a feel for the ancients. Colorfully costumed evzone guards stand at attention at the Tomb of the Unknown Soldier and periodically do a ceremonial changing of the guard to the delight of tourists (guards change five minutes before the top of each hour, less elaborate crossing of the guard around :25 after, full ceremony with marching band Sundays at 11:00—get there early as they may start a bit before 11:00). The National Archaeological Museum is far and away the top ancient Greek art collection anywhere. Ancient Greece set the tone for all Western art that followed, and this museum lets you trace its evolution — taking you in air-conditioned comfort from 7000 BC to AD 500 through beautifully displayed and described exhibits on one floor. You'll see the rise and fall of Greece's various civilizations: the Minoans, the Mycenaeans, those of Archaic Greece, the Classical Age, and Alexander the Great, and the Romans who came from the west. You can also watch Greek sculpture evolve, from prehistoric Barbie dolls, to stiff Egyptian-style, to the David-like balance of the Golden Age, to wet T-shirt, buckin'-bronco Hellenistic, and finally, to the influence of the Romans. Walk once around fast for a time-lapse effect, then go around again for a closer look. This museum is a great way to either start or finish off your sightseeing through Greece. It's especially worth visiting if you're traveling beyond Athens, because it displays artifacts found all around Greece, including Mycenae, Epidavros, Santorini, and Olympia — and the treasures displayed here are generally better than those remaining at the sites themselves. The sheer beauty of the statues, vases, and paintings helps bring the country's dusty ruins to life. The two main attractions — the archaeological site (officially called the "Sanctuary of Apollo") and the Archaeological Museum — are about a half-mile east of the modern town of Delphi. Allow 1.5–2 hours for the site (hiking to the stadium alone is nearly a half-hour round-trip), and another 45–60 minutes for the museum. You can do the archaeological site and the museum in either order. Crowds and weather might help you decide. If it's hot or raining, do the museum first to hedge your bets for better conditions for the site. With all things being equal, I recommend doing the site first: You'll have more energy for the climb (there's a 700-foot elevation gain from the entrance to the stadium), and later, when you tour the museum, you can more easily imagine the original context of the items on display. Leonidas and Panagiota have retired from running their restaurant. With my favorite irresistible dinner views on Hydra, this scenic spot lets you watch the sun dip gently into the Saronic Gulf, with Kaminia's adorable port in the foreground. Owner Dimitris takes his own boat out early in the morning to buy the day's best catch directly from the fishermen. For meals, you can sit out on the shady covered side terrace above the harbor — check the chalkboard to see what's freshest today. For drinks, sit out front on the porch. Relax and take in a sea busy with water taxis, ferries that connect this oasis with Athens, old freighters — like castles of rust — lumbering slowly along the horizon, and cruise ships anchored as if they haven't moved in weeks. Hi, I'm Rick Steves back with more of the best of Europe. This time it's all Greek to me…and that's exactly why we're here. It's Athens. Thanks for joining us. About five centuries before Christ, Athens was the center of the Western world. At a time when Rome was just a village, it was here that the foundations of our Western civilization were laid. And today, in the midst of all this rich heritage, the vibrant capital of Greece still thrives. We'll enjoy the magnificence of ancient Athens — marvel at the wonders of the Acropolis, savor some tasty Greek street food, and check out the premier collection of ancient Greek art. Then we'll poke around the Plaka before escaping the big city to consult an ancient oracle and relax on a classic Greek isle. In the extreme south of Europe is Greece. Its capital is Athens. From there we side-trip to the oracle of Delphi and then cruise from Athens' port of Piraeus to the island of Hydra. We'll start up there, at the historic, cultural, and literal high point of any trip to Athens — the Acropolis. Like other hilltop sights in the ancient Greek world, Athens' Acropolis (or "high city") was both a place of worship and of refuge when under attack. Crowned by the mighty Parthenon temple, the Acropolis rises above modern Athens, a lasting testament to Greece's glorious Golden Age in the fifth century BC. Grand processions followed the Panathenaic Way, which was a ceremonial path connecting the town below and the Acropolis. They'd pass through this imposing entryway and up to the religious heart of the city and the Parthenon. The Parthenon was perhaps the finest temple in the ancient world. Valiantly battling the acidic air of our modern world, it still stands with the help of on-going restoration work. It was constructed in the fifth century BC and dedicated to the virgin goddess Athena. Seeing it today is awe-inspiring but imagine how striking it must have looked when it was completed nearly 2,500 years ago — in all its carved and brilliantly painted splendor. The adjacent Erechtheion is famous for its Porch of the Caryatids, six beautiful maidens functioning as columns. Dedicated to Athena and Poseidon, this was one of the most important religious buildings on the Acropolis. This, rather than the Parthenon, was the culmination of the Panatheniac Procession. At the foot of the Acropolis, the Ancient Agora (or "marketplace") sprawls out from its surviving temple. This is where, for 3,000 years, Athenians gathered. While the Acropolis was the center of ritual and ceremony, the agora was the beating heart of ancient Athens. For some 800 years, starting in the sixth century BC, this was the hub of commercial, political, and social life. Visitors wander the remains of what was the city's principal shopping mall and administrative center. Exploring the agora, it's fascinating to ponder the world of Plato and Aristotle and the age which laid the foundations for Western thinking about economics, democracy, logic, and more. The Stoa of Attalos, from the second century BC, was rebuilt in modern times to house the Agora's museum. With so little of the Agora still standing, this reconstruction makes it easier to imagine the sight in its original glory. Crowds would gather in shady porticos like this to shop, socialize, or listen to the great philosophers of the age. In fact, Socrates spent much of his life right here preaching the virtues of "nothing in excess," and urging those around him to "know thyself." The Temple of Hephaestus, one of the best-preserved and most typical of all Greek temples, dates from about 400 BC. Like the Parthenon it's constructed in the simple Doric style. It housed big bronze statues of Hephaestus, the blacksmith god, and Athena, patroness of the city. Greek architecture evolved in stages. The capitals, or tops of the columns, were both functional and decorative. While just the tip of the architectural iceberg, these are handy indicators helping us identify the three main architectural "orders" (or styles). The earliest style, Doric, has flat, practical plates as capitals. In the next order, Ionic, the capitals are decorated with understated scrolls. The final order, Corinthian — popular later on with the Romans — features leafy capitals…boldly decorative with no apologies necessary. How to remember all these? As the orders evolve, they gain syllables: Doric, Ionic, Corinthian. But for most travelers, the agora is more than an architectural review. Strolling in the footsteps of Socrates is your best opportunity to commune with the epic Greek past. Like so many great civilizations, ancient Greece peeked and then faded. Two hundred years ago, Athens was just a small town surrounded by big ruins, sitting on lots of history. That 19th-century Athens is today's Plaka. The Plaka district provides tourists with a more intimate Athens: no chaotic traffic, lots of colorful restaurants, and the best souvenir shopping in all of Greece. And for a quick, inexpensive bite to eat, drop by a corner gyro and souvlaki stand. Gyro means "turning" — referring to the slowly spinning round of meat — roasted pork or chicken — shaved as needed. And souvlaki is meat on a skewer — shish-kebab style. My favorite: a gyro pita — slice up that meat, toss in a little salad, tsatstiki (a garlic yogurt sauce), and spices…all wrapped in a handy cone of toasted pita bread. Energized by a tasty gyro, hike to the top of the Plaka and explore the charming "village" of Anafiotika (literally "little Anafi"). It was built in the 19th century by people from the tiny Cycladic island of Anafi. They came here to the big city looking for work. In this oasis of tranquility, nestled beneath the walls of the Acropolis, the intensity of Athens seems miles away. Weave through narrow paths lined with flowers, and dotted with cats dozing in the sunshine. Observe the peaceful rhythm of daily life. And, with a little luck, you can make a friend and be invited in — or, in this case — up onto the roof — for a pleasant chat and a cup of strong Greek coffee. Athens is getting more and more people-friendly. This elegant walkway is a popular pedestrian boulevard arcing around the back of the Acropolis. As the sun goes down, it's busy with locals and visitors alike. At the end of the walk, prime Acropolis-view real estate is dedicated to the fine art of café sitting. Sipping a drink here puts you right in the middle of a lively Greek scene. In Athens, it seems all roads pass through Syntagma Square. Today, people pour out of the city's busiest subway station into this café-filled square. Shady trees make it a breezy and restful spot. Two hundred years ago, Athens was just a humble town of about 8,000 huddled at the base of the Acropolis. But when the Greeks won their independence from the Ottoman Turks in the early 1800s, they chose little-but-historic Athens to be their capital. This stately square was part of a grand project designed to turn the town a suitable capital for the new nation. The original square was essentially a big front yard for the new royal palace. The country's leading families built mansions here to be close to the king. These mansions survive today as grand old hotels, embassies, and museums. In 1843, a riotous crowd jammed this square demanding a syntagma (or "constitution"). The king gave a speech from this balcony, granting his people — whose ancestors invented the concept — democracy. This place has been known as Constitution Square or Syntagma Square ever since. Today, the Royal Palace houses the Greek Parliament. The palace and the Tomb of the Unknown Warrior are guarded by the much-photographed evzones. These flamboyant soldiers, with their distinctive strut, change at the top of each hour. They're clad in the traditional pleated kilt and pom-pom shoes made famous by the evzones. These mountain fighters battled ferociously in Greece's early 19th-century War of Independence. They claim the soldiers' outfits have 400 pleats — one for each miserable year of Turkish occupation (and don't you forget it). Buoyant after winning freedom from its Turkish overlords, the new capital city flourished. Some of those first government buildings — built in the prevailing Neoclassical style — still survive today. They stand amid today's bustling metropolis. In the 20th century, with an influx of refugees and industrialization luring workers in from the countryside, the population of Athens exploded. The flow of people into the sprawling city continues, and four million people — roughly one out of every three Greeks — call Athens home. And recently, the city has curbed pollution, cleaned up and pedestrianized the streets, spiffed up the museums, and invested in one of Europe's better public transit systems. Descend into Athens' sleek and cool underground and you'll enjoy a transit system as efficient as anything in Europe. With all its traffic congestion above and nearly a million Athenians zipping smoothly underground every day, the system is a godsend. Ermou Street, leading away from Syntagma, is a thriving pedestrian mall. Just a few years ago, this street was a car-clogged mess. Once again, when it was first pedestrianized merchants were upset. Now, it's a hit with everyone. The one must-see sight outside the central tourist zone is the National Archaeological Museum. This extraordinary collection lets you follow the sweep of Greek art history from 7000 BC to 300 AD. A trove of funerary art from the royal tombs of Mycenae shows treasures from a society that thrived around 1000 years before the days of Socrates and Plato. You'll see finely decorated weapons and sheaths….exquisite golden jewelry…and the delicate Vaphio gold cups — reminders of the sophistication of that 15th-century BC civilization. This Warrior Vase, from the 12th century BC, shows women gathered to wave goodbye to a group of warriors heading off to war — sporting fancy armor with duffle bags hanging from their spears. These Mycenaean soldiers — with their yellow-ribbon moms — are a timeless off-to-war scene, repeated every generation in the 3,000 years since. Ancient Greeks celebrated the human body. To them it was the embodiment of the order found in nature. All the parts were there in geometrical, if not biological perfection. No individual features — everything was idealized. In fact, these archaic statues were named simply kouros (meaning "boy"), or kore (meaning "girl"). Statues from this age — around 600 BC — all had the same standard features: weight spread evenly on two feet, arms rigid at the side, stiff braided hair, almond-shape eyes, high eyebrows, and the same quirky little grins. Archaic statues all looked like cousins. During the Archaic period, all the parts were there, but if it decided to walk, it would walk like a monster, stiffly with no understanding of the subtle interplay between hips and shoulders. But Greek art evolved with its society. The 80-year period from about 480 to 400 BC is known as the Golden Age of Greece — the age of Socrates and Pericles — and Athens was the center. During this time, the golden mean was "nothing in excess." In both life and art, everything was to be in balance. Golden Age sculptors shifted weight more believably, placing their statues in a contrapposto pose — that means relaxed, with hips shifted realistically and weight resting on one foot. Statues looked more lifelike. Ancient Greek treasures include the Poseidon of Artemision. This stunning bronze statue, cast in 460 BC, depicts the mighty god of the sea about to hurl his trident. Once again, we see that classic Greek balance between stillness and motion. But in around 330 BC, Athens was conquered by the Macedonians from the north. Subjugation by the Macedonians under Phillip II and his son Alexander the Great ushered in what's known as the Hellenistic period. The word Hellenistic refers to Greek culture after its political conquest. Greek Hellenistic art, like Greek Hellenistic society in general, evolved beyond the aesthetics of the Golden Age. While less balanced and composed, it was a more individualistic age — with more exuberant and emotional art. The Horse and Jockey of Artemision, cast in the second century BC, is filled with this Hellenistic energy. The high-spirited detail is astonishing, right down to the horse's dramatic head, and the concerned look on the young jockey's face. The evolution of Greek art from stiff to realistic to emotional would be echoed by Europe 2,000 years later: from stiff Gothic to realistic Renaissance, to emotional Baroque. A two-hour drive northwest of Athens takes us to Delphi, one of the most important sights in the ancient world. Wherever you travel, seeing the precious artifacts in the big city museums first helps you better appreciate the historic sites out in the countryside. Ancient Delphi, perched high on the slopes of Mt. Parnassos, was not a city. It was the site of the oracle of Apollo, god of the sun. People would journey here from all over the known world to seek wisdom from the gods on vital affairs of state. Today tourists zigzag up the ancient Sacred Way to the Temple of Apollo. The path is flanked by the remains of Delphi's famous treasuries — monuments erected by city-states in gratitude for the oracle's advice. Local guides like Penny Kolomvotsou brings these ancient and mythic events to life. Rick: So tell me why this place was chosen for the oracle. Penny: Zeus wanted to know where the center of the world was. He let two eagles fly from the two opposite ends of the universe and this is where they met, here in Delphi. Rick: So he called this basically the bellybutton of the world. Penny: Yeah the omphalos, yeah this wonderful place became the center of the world. The resulting Sanctuary of Apollo reached the height of its power between the sixth and the fourth centuries BC. The oracle became so influential that no great leader would make a major decision without first sending emissaries to consult the oracle. Penny: There was a priestess inside the Temple and right underneath it there was this room where she was inhaling vapors evaporating from the ground. So she was in trance. Rick: So she would babble and the priests would say this is wisdom from the gods. Because the priests debriefed those seeking advice on the state of their homelands, Delphi became the data base of the ancient world. Because of that the priests here were actually able to astound those who came with their wise, believably divine, advice. And there was more to Delphi than just the oracle. Rick: So people from all over the Greek-speaking world came here. Penny: Correct. And apart from coming here to consult the oracle, the other reason was also because, like in Olympia they had the Olympic Games, here in Delphi we had the Pythian Games. Yeah, these were competitions concerning music, poetry, sport events as well. Rick: So a balance of things. Music and sports. During those pan-Hellenic (or "all-Greek") festivals, Delphi filled its theater, which seated 5,000. And it packed as many as 7,000 sports fans into its stadium. I like being here at the end of the day — with the tourists gone, cheers of the long-gone crowds still ringing in the cool mountain air, and the starting block all mine. As it was in ancient times, Piraeus is still the port of Athens. From Piraeus boats depart for points throughout the Aegean Sea. Cruise ships await their passengers. And hydrofoils vie with lumbering car ferries. It's an exciting springboard for the Greek Isles. We're riding a Flying Dolphin — one of the fleet of speedy hydrofoils that zip from Athens to the islands, and from island to island. It's fast but less scenic, as the passengers are stuck inside. I like to hang out in the windy doorway. After a 90-minute ride, Athens is a world away, and we pull into the isle of Hydra. Its main town, also called Hydra, is home to about 90 percent of the island's 3,000 residents. After the noise of Athens, Hydra's traffic-free tranquility is a delight. I'm glad I'm packing light as I hike up to my hotel. Hydra is one of the prettiest towns in Greece. Its superb harbor is surrounded by an amphitheater of rocky hills. There's an easy blend of work-a-day commerce, fancy yachts, and lazy tourists on island time. Donkeys rather than cars, the shady awnings of well-worn cafés, and memorable seaside views all combine to make it clear you found your Greek isle. Hydra was a Greek naval power famous for its shipbuilders. The harbor, with twin forts and plenty of cannon, housed and protected the fleet of 130 ships as the Greeks battled the Turks in their early 19th-century War of Independence. The town stretches away from the harbor — a maze of narrow, cobbled streets, flanked by whitewashed homes. In the 1960s, the island became a favorite retreat for artists and writers, who still draw inspiration from its idyllic surroundings. One of the island's greatest attractions is its total absence of cars and motorbikes. Instead, donkeys do the heavy hauling today just as they have through the centuries. And, I suppose, for just as long they've treated children to rides as well. At the top of town, the humble Taverna Leonidas has been around so long it doesn't need a sign. The island's oldest and most traditional taverna was the hangout of the sponge divers a century ago. These days Leonidas and Panagiota feed guests as if they're family. And tonight the place is all ours, as our enthusiastic cook welcomes us into his kitchen. Rick: So what are we cooking? Leonidas: We cook the lamb with the roast potatoes. Green shrimp with a lemon sauce, calamari with a garlic sauce, spanakopita—spinach pie. Leonidas: Eggplant. And then beets. And before we know it, Leonidas has us all sitting at the table and he starts bringing in wave after wave of his fabulous dishes…. Rick: Here we go, the shrimp. Leonidas: Yeah the shrimps, green shrimps with the oil and lemon sauce. A fleet of taxis shuttle people to outlying hamlets and beaches. We're catching one for a windy survey of the island and to be dropped off for a scenic hike back into town. Hydra is popular with walkers, who come to explore the network of ancient paths that link the island's outlying settlements, churches, and monasteries. And in springtime, hikes come with fields of wildflowers. A delightful way to cap the day is to follow the coastal path to the village of Kaminia. Its pocket-size harbor shelters the community's fishing boats. Here, with a glass of ouzo and today's catch, as the sun slowly sinks into the sea and boats become silhouettes, you drink to the beauties of a Greek lsland escape. Perhaps nowhere else does the historic and cultural timeline of Europe reach so far back while being so vibrant today. I hope you enjoyed our look at Athens, the oracle of Delphi, and the romantic isle of Hydra. I'm Rick Steves. Until next time, keep on travelin'. Antío. Subtle interplay between hips and shoulders. Capitals grew bigger and bigger to an absurd size when finally they supported entire temples. The king gave a balcony from this speech.